Our final destination was Bangkok. For those of you who haven’t visited this City, you’ll be happy to know that the luxury hotels here are quite reasonably priced. We spent weeks/months trying to find just the right place to stay and we found many options at 5-star properties, including the Peninsula, the Conrad, the Four Seasons, the Mandarin Oriental, JW Marriott, plus a ton of others that are not part of a western chain, with rates less than $175/night. Since I’m a Starwood guy, we decided to stay at the St. Regis. We event decided to book through American Express Fine Hotels and Resorts – which is a benefit of the American Express Platinum Card. For those of you not familiar with AmEx FHR, basically you get a room (that in my experience is the same rate as you can get by booking directly with the hotel), but you get a guaranteed noon check-in, 4pm late check-out, room upgrade, breakfast included and property credit – usually $100 to be used at the spa, the restaurant, bar, etc. While each property could have a slight variation of these benefits, these are the basics. Plus, unlike some other online travel agencies/booking sites, you get your stay credit and points in the frequent traveler program. Win-Win. Since we weren’t arriving until nearly 23h00, the early check-in didn’t matter to us, but the late check-out was critical, since our flight wasn’t until 23h30 on day of departure. Even before we arrived, I was impressed with the service. As I had mentioned throughout these trip reports, we didn’t do a whole hell of a lot of planning before we actually began travel, I hadn’t planned for anything in Bangkok. As we arrived at the Le Meridien in Siem Reap, I emailed the concierge at the St. Regis Bangkok, telling them about our trip and that I needed their assistance in planning a private tour of the City. By this point of our trip, I was pretty much vacationed out– we’d hit southeast Asia hard. Up and out before 08h00 every morning and not back to the hotel until sometime between 22h00 and 00h00 each night. As you’ve seen too, we weren’t sitting on the beach either, we were on a grueling bike ride, or hitting dozens of sites and walking all over these Cities. We needed a vacation from our vacation. 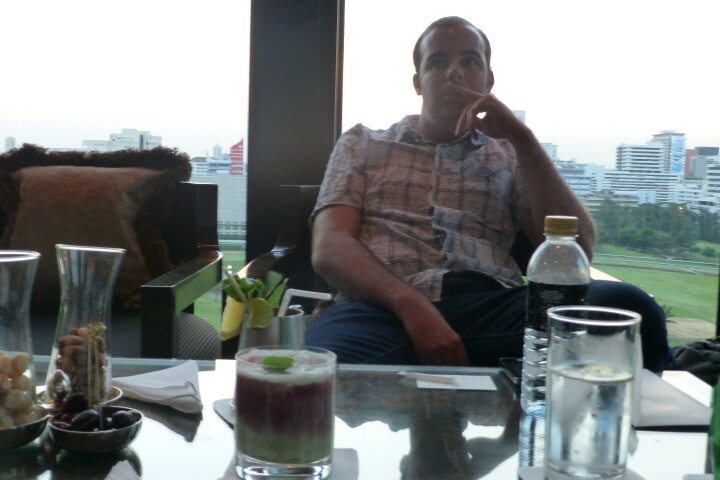 I told the concierge that I wanted a tour of Bangkok – I wanted to see the 6-8 most important things. I wanted to start around 09h00 and I wanted to be back to the hotel around 15h30. I felt like an obnoxious American tourist who was just working his way through a checklist, but I wanted time to relax and I knew I’d kick myself if I didn’t see anything in Bangkok. We arrived at the hotel around 22h30 (no taxi driver at the airport had even heard of the St. Regis – to their credit, it was relatively new). The bellman greeted me by name and took our bags. The lobby is not at street level – you have to take an elevator up to the sky lobby. We were quite the sight too — we’d been schlepping through the blazing heat and humidity of Phnom Penh and the Killing Fields – now we were stumbling into a beautiful new 5-star hotel. It was a nice change. We were escorted to the check-in desk, where as soon as we sat we were offered a bottle of water and the kind young woman started to check us in. She was very nervous and giggled each time she made a mistake on the computer (which was quite frequent). She explained the benefits of being a Gold SPG Member and how those coupled with the AmEx FHR benefits. She said we were given an upgraded room. She even confirmed the spa appointments we made via the concierge when we were in Cambodia. She knew where we were coming from and reminded us that we had scheduled a private tour the following morning. Although nervous as can be, she knew her stuff. She returned my passport, handed us our keys and personally escorted us to our room, with the bellman in tow. She did get lost twice as she was trying to find our room though. Our room was quite nice – head and shoulders above each previous night on this trip. It smelled fresh, clean and welcoming. You could feel the travel tension just melt away. The room itself wasn’t huge by any stretch of the imagination, but it did have ample room for us. As you walk in there was a long hall with a closet and shelf area (for a suitcase) to the left and an entrance to the bathroom on the left. As you continue into the room proper you see a king sized bed on the right wall with a small (very comfortable) sofa in the far corner. On the wall opposite the sofa was a writing desk with two chairs. I did take time to write hand written letters to a couple friends on the St. Regis stationary. While this is definitely something from a bygone era, the people I wrote are old souls like me, who enjoyed the old world touch. 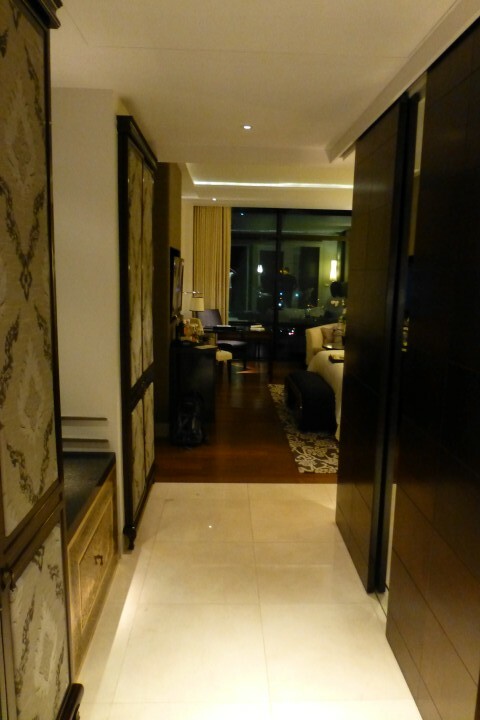 The bathroom had two entrances – one from the hallway near the front door and the other adjacent to the bed. The bathroom was warm and bright. Despite the nearly all white tiling it did not have a sterile feeling at all. 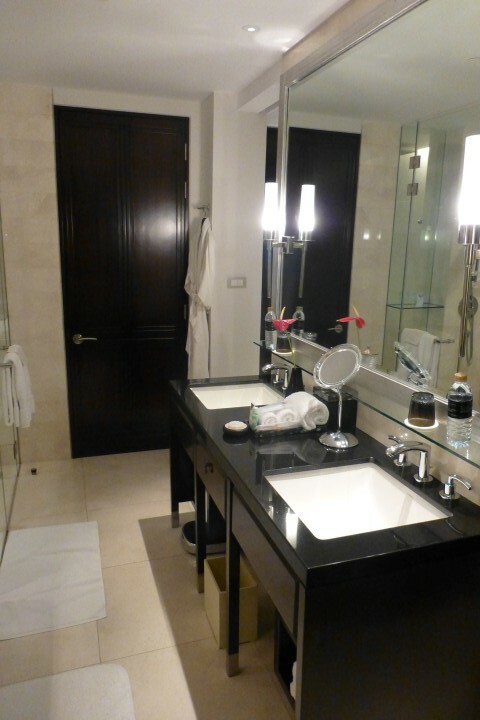 The contrast of the dark wood of the vanity really warmed up the space. 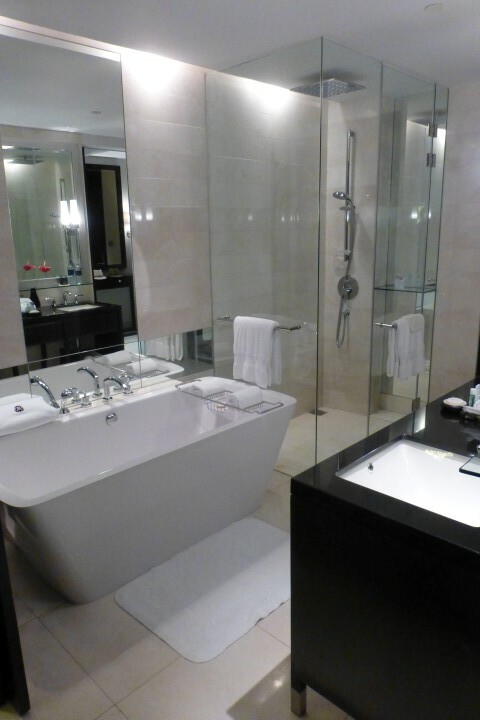 There was a separate walk in shower and a large bathtub. I usually don’t care for bathtubs in hotels, but I was really digging this space. There was a scale in the bathroom too — I guess it is a nice touch, but when vacationing, who wants to know how much weight they’ve gained. 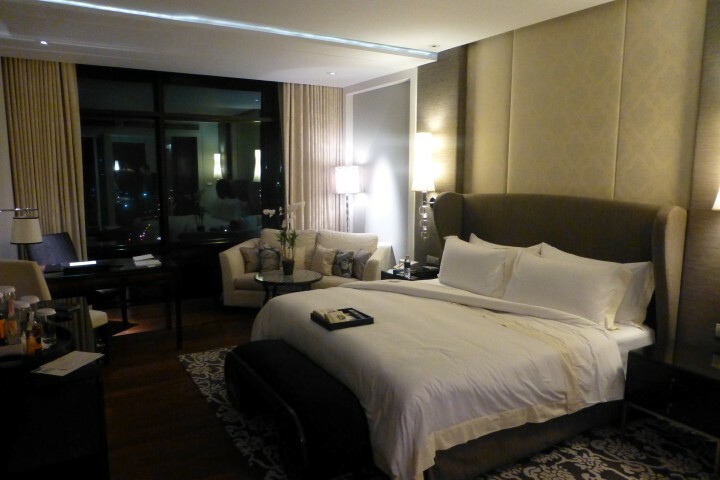 On our second day, after our half day tour of Bangkok, we returned to our room. We were tired and needed a break. We decided to hang out in the room and just relax until dinner at 20h30 that evening. We pulled up the butler menu (much of which is complimentary) and decided to order some afternoon tea. 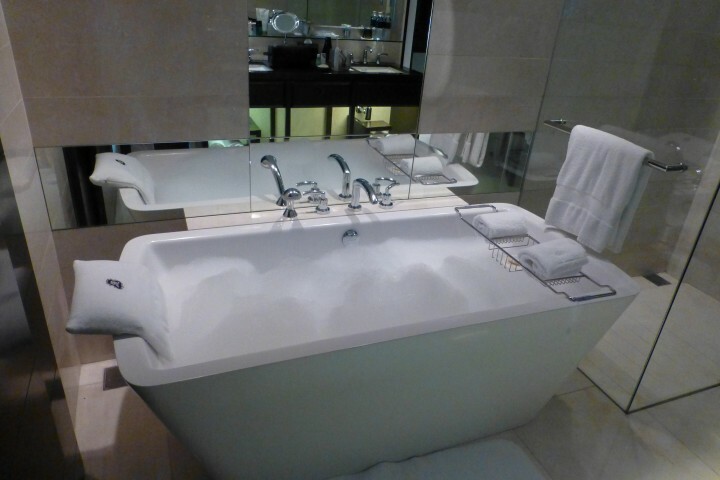 I also decided to have the butler draw me a bubble bath. I hadn’t had a bubble bath in years. Mike had one when we were in Zimbabwe (I didn’t like the idea of not seeing in the water in Zim — who knows what was lurking in there). I grabbed a couple of magazines that I’d been lugging around the entire trip and settled into a nice hot tub — I may have ordered a bottle of champagne too (not complimentary, but absolutely worth it). After spending about 75-90 minutes in the tub, I was sufficiently pruned up and decided to move on with the day. The final afternoon we returned from our cooking class at the Mandarin Oriental to our 15h30 spa appointments. This is where the stay at the St. Regis went from amazing to utterly miserable. 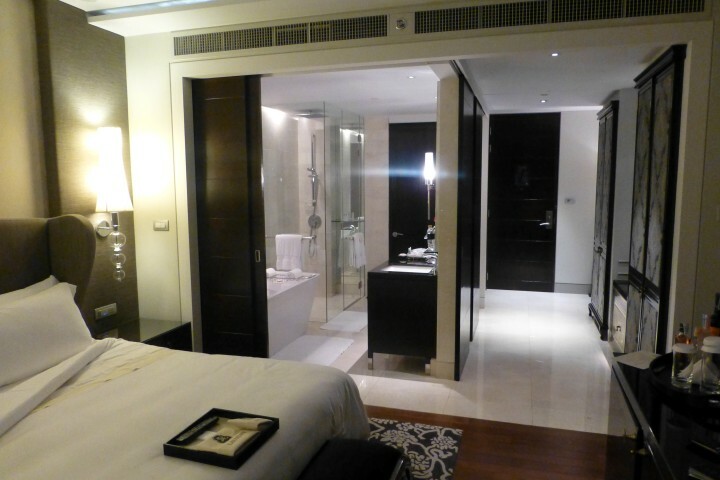 With the AmEx FHR stay, we got $100 in spa credits, which we planned on using our last day. The concierge knew our plans and helped us book the appointments and even gave us the suggestion to do the appointments as late as possible so we could be relaxed and then shower before our long flights back home starting late that evening. At 15h00 (when I was getting ready to head to the spa) the spa called and said we were missing our appointments, which they claimed their were set for 15h00. We had confirmed twice onsite when the appointments were. MS took off to get this massage and I needed a couple minutes more to pack. I was informed that my appointment was cancelled, but I’d still need to pay for it, as I was a no-show. I called the concierge and after about 25 minutes of trying to solve the problem they eventually relented and said my appointment was now set for 15h30 (as it should have been the whole time). Unfortunately, I didn’t have time to explore the spa before my treatment began. My masseuse did a very nice job, but at the very end reminded me to tip him. Lovely. Since MS and I were in the same room and the massages have to be charged to the room for the AmEx FHR credit to kick-in, I couldn’t settle up at the spa until MS was done. I wandered around the area near the spa and after a few minutes MS came out – steaming mad. Evidently the hotel had already checked us out and we had to pay separately for the spa services. Easy enough to fix, we’d go back up to the front desk and get it sorted out. Unfortunately it looked like a huge bus had let out and the lobby was full of people checking in. We worked our way to the concierge and explained the situation. “Sorry – can’t help, you’re already checked out” was the message we got. We explained again. Same message. I asked for the manager. Someone else came and told me that we were out of luck. At this point I was figuring the best bet would be just to deal with American Express and have them sort it out, but I again asked for the Hotel GM and this time a woman came up to help us. We explained what happened – she said she would take care of it — but told us that next time we should work with the concierge to book these appointments and confirm during the stay (yeah, we did that). This was a very frustrating end to our stay. And to add insult to injury, we didn’t get the additional SPG points that we would have earned for the spa services since it was processed outside of our room charges. It’s just a few hundred points, but it was salt in the wound. We decided to go sit at the bar and have a cocktail before we headed off to the airport. As you can see my anger and frustration were not at all hidden during cocktail hour. Before we left there was a show on the terrace with a member of the bar staff sabering a bottle of champagne. It took him 5 or 6 attempts, but he eventually got it. Hey – free champagne, what’s not to love. 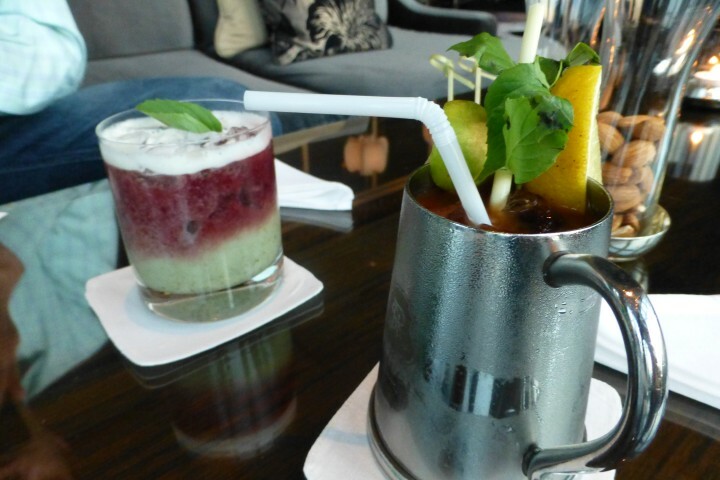 All in all, I really enjoyed the St. Regis Bangkok. I would return next time I visit the area too. What was an almost flawless stay was really turned up on its end by the poor service in the spa and the subsequent blaming of us for the issues. While everything ultimately got resolved, it really did mar the end of our stay. Rumor has it (and I haven’t done any research on this), but the spa staff are 100% contract workers who just lease space from the St. Regis and have no real affiliation with the hotel. 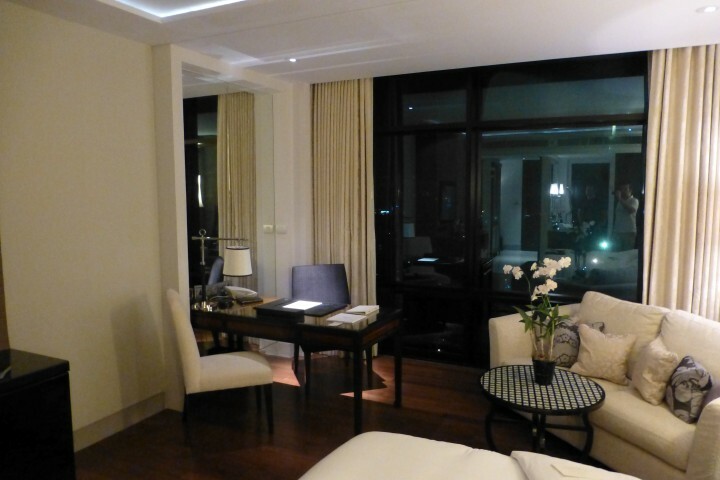 My advice for Bangkok Hotels — stay at a 5-Star Property, they are cheap. Work with their concierges to plan an amazing trip, but confirm everything upon arrival AND the morning of. Don’t let anything go to chance. 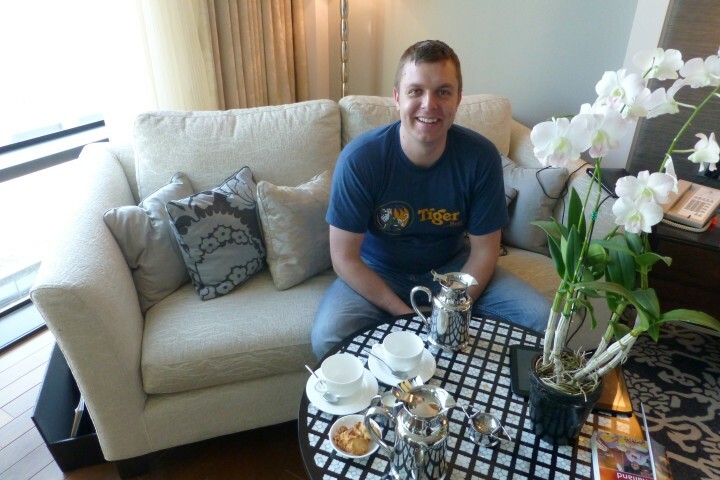 Where did you stay in Bangkok? Do you hit the higher end (yet reasonably priced) hotels or do you go more with a local flair? How much do you work with the concierges at a hotel – do you trust them or book on your own? By Tim in Travel on February 4, 2014 .